Israeli forces struck targets across the Gaza Strip in response to a surprise rocket attack from the Palestinian territory. “Israel will not tolerate this. I will not tolerate this,” Prime Minister Benjamin Netanyahu declared during a White House meeting with President Trump. 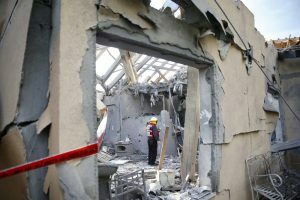 A firefighter inspects the damage to a house hit by a rocket in Mishmeret, central Israel, on Monday. Six people were wounded in the attack an Israeli rescue service said.